Dr. Rittle speaks to members of N.A.R.V.R.E. 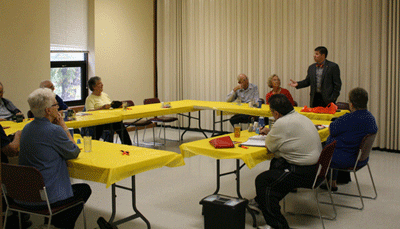 Cowley College president Dr. Rittle spoke with members of N.A.R.V.R.E., the National Association of Retired and Veteran Railway Employees, Inc. Thursday, Nov. 5 inside the Arkansas City Senior Citizen Center. Mary Benton welcomed Dr. Rittle to the meeting. “Dr. Rittle is loved by staff and students and we are so glad he is with our college,” Mary Benton said. Dr. Rittle shared information about his upbringing and the career path that led to his becoming the fifth president in the history of Cowley College. He also provided historical information about the College. Following his presentation, Dr. Rittle answered questions from those in attendance.